The first post in this mini-series dealt with my experiences with loneliness as a first year graduate student and how I eventually overcame it. It was a difficult year, and I wish I knew then all the things I know now – I would have been a much happier, more social student! In any case, I made it through my first year as an OT student, and now I have several good friends both in and outside my program who have become part of my new friend groups. If you are struggling with feeling like you don’t fit in or you’re having a hard time making friends, I hope these tips will help! After reading this post, I hope you’ll find that making friends as a graduate student is easier than you thought. 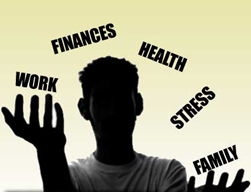 Psychosocial health is an important element of any person’s daily functioning, and it can have a significant impact on performance in many other areas of life. Loneliness is something that everybody has probably experienced in life, and it’s something that I often struggle with whenever I have to start over in a new social setting – for example, moving to a new city and starting grad school! Although I am often described as a talkative, friendly, and outgoing person, I’ve had several experiences when I’ve felt extremely socially isolated and lonely, such as my first year of college and a job as a camp counselor. Although in these settings I was surrounded by people and opportunities to make friends and have fun, I spent a lot of time alone and struggling to find people to connect with. It’s a challenge I’ve continued to have in my adult life, but it’s also something that has helped me better understand myself and how I can be most successful as I continue to move around, start new endeavors, and meet new people. This post was difficult for me to write, because it really puts all of the negative feelings, anxiety, and loneliness I experienced during my first year of graduate school out there. It’s not easy admitting that I had a hard time, and maybe to most people I seemed fine. But if I’m honest, my first year in graduate school was a challenging transition that I was not prepared for. Knowing that many of my friends from undergrad were also in the same boat (living/working in a new place without many friends) and talking to them about my situation made it a little easier, but I had to learn the hard way that life in grad school is NOT the same as it is in undergrad – or at least it wasn’t for me! One of the reasons I love my OT program is that my instructors understand the importance of the “patient perspective.” Many of my homework and class activities have focused on understanding the experience of the clients OTs work with, and how personal factors (in OTPF language) can impact their recovery and the therapist’s treatment. My classes also often include guest speakers with all kinds of experience and commentary, as well as enlightening field trips to businesses I will likely work with in the future (i.e. a local medical equipment company that sells power and manual wheelchairs and other mobility devices). 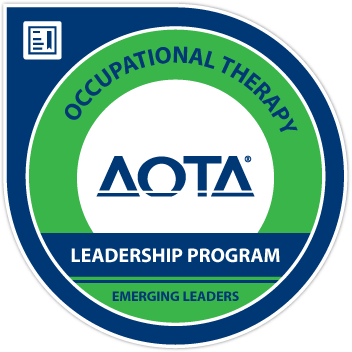 The OT program is also housed in a great allied health department that often hosts speakers and presentations on a variety of topics related to the patient experience, and I try to attend as many of these programs as possible. One of my favorite things about having class speakers with various diagnoses and experiences is that it truly brings my textbooks alive. 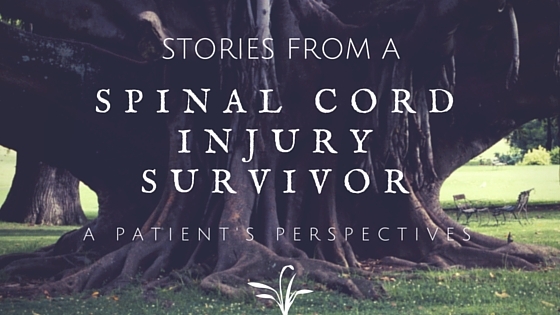 It’s one thing to read about “autonomic dysreflexia,” “intermittent catheterization,” and “psychosocial factors” in a textbook chapter about working with spinal cord injury (SCI) survivors, and another thing ENTIRELY to have an SCI survivor and his wife and caregiver talk to you about their experiences with these things across the continuum of care (hospital to rehab to discharge home). 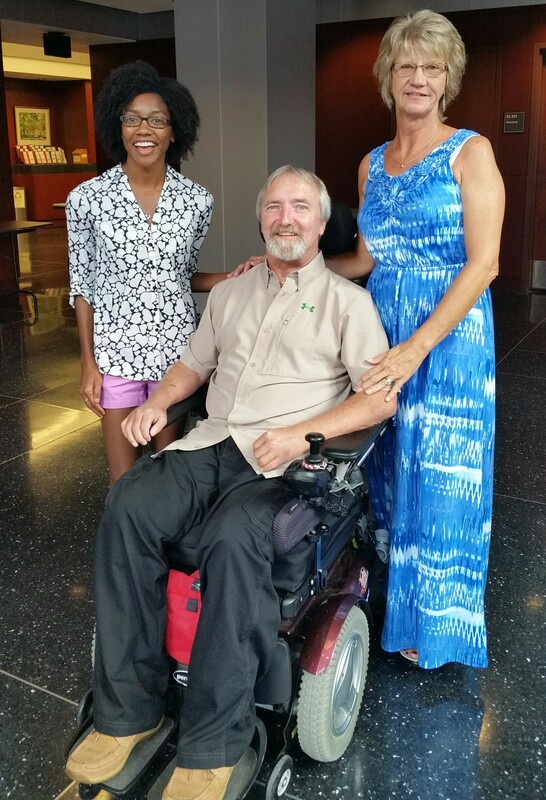 That brings me to the point of this post: recently I was fortunate enough to meet and learn from a man named “Brian,” his wife “Sarah,” and his caregiver “Tonya.” Two years ago Brian was riding his motorcycle with a friend when he was struck by a distracted driver who was texting at the time. Although Brian was wearing a helmet and there was apparently not a physical scratch on him after the accident, he sustained a high level (C5) spinal cord injury that left him with little function in his neck, limited function in his upper extremities at the shoulder, and virtually no motor or sensory function below the shoulders. 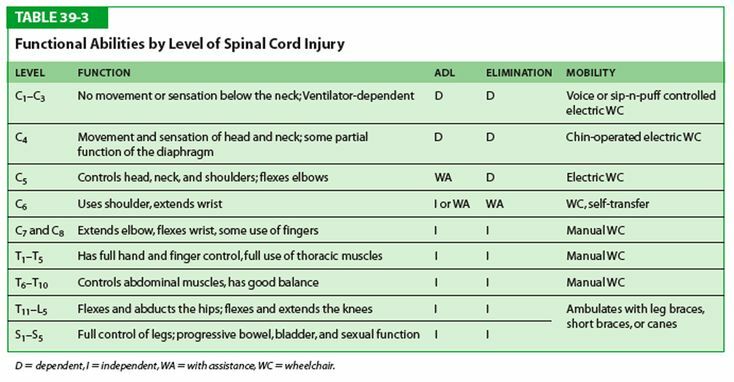 To gain an understanding of the specific regions that were paralyzed and functions that were affected, you can check out this diagram. The accident was a very traumatic life experience, but in talking with Brian you would hardly know the true depths and trajectory of his recovery. He was a good-natured jokester with a white beard who, alongside his wife Sarah and longtime caregiver and friend Tonya, had a very positive outlook on life and a great deal of helpful information for soon-to-be therapists like myself and my classmates. This post is about the lessons I learned from talking with Brian and his crew last week and why they are so important for me to keep in mind as I get closer and closer to being an OT practitioner. “Brian” and his wonderful wife “Sarah” were fantastic speakers, and I’m so glad I got the chance to learn from them! In case you didn’t know, my friend Abby over at OT Café has an AMAZING new “Day in the Life” series on her blog to celebrate OT Month. She has reached out to OTs all over the place to learn more about what they do, the populations they work with, and what they love about their jobs, and if you’re interested in a career in OT, working in a specific practice area in OT, or learning more about the OT school experience, you should check it out! All of the posts can be found HERE, and they will be updated throughout the next few weeks as she rolls all of the posts out in April. I’ve been following all of her posts in the series, and it’s great to have practitioner stories and perspectives from different practice settings in mind as I begin thinking about what I’d like to do when I leave school. Back in November, I wrote about occupational therapy’s role in mental health, specifically the profession’s advocacy for occupational therapy’s inclusion in the Substance Abuse and Mental Health Services Administration (SAMHSA) legislation that will create Certified Community Behavioral Health Clinics (CCBHC). On February 2nd, SAMHSA released their draft criteria (which you can read here) and occupational therapy is one of the professions that have been identified as potential CBHC providers! Although the document is just a draft, which means that we aren’t officially in the door, it’s still an important stride being made for the profession and for the clients who OTs have the potential to help in the future. 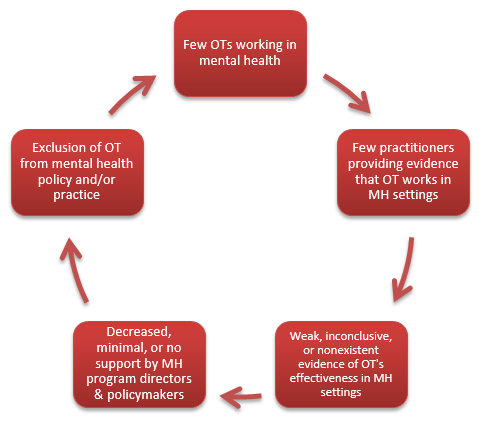 However, with occupational therapy’s inclusion in SAMHSA’s CBHC draft comes a chance to break the cycle and make it known that occupational therapists bring valuable tools, insight, and clinical expertise to the field of mental health. In the same article I cited previously (available in full to AOTA members), the author offers several practical solutions to help remedy the current shortage of occupational therapists practicing in mental health, including increased professional advocacy at the state and local levels for the effectiveness of OT in mental health and high-quality research to support this conclusion. I think that occupational therapy has a bright future in mental health, and I am hopeful that the next generation of therapists will be better-prepared, more confident, and capable of taking on the many challenges presented by working with people living with mental health concerns. We’re now one step closer to breaking the cycle, and I’m excited to see what happens when we reestablish our role as qualified mental health professionals! If you’re interested in learning more about occupational therapy’s role in mental health, check out these articles describing how the unique skills of OTs have made a difference in the lives of people with mental health concerns, including children, veterans, and families. Military Service Members and Veterans: Occupational therapy interventions help veterans living with PTSD re-establish routines, learn how to cope with their symptoms, and successfully rejoin their communities. Children & Adolescents: The community-based OT that the high school student in this article is seeing is helping him learn independent living skills that will help him become less dependent on his family members and likely ease the caregiver burden his mom reports experiencing. Professional Opportunities for OT in Mental Health: AOTA President Ginny Stoffel authored a useful article that reviews the multiple opportunities for occupational therapy in mental health, including having OTs be members of primary care and “integrated treatment” teams and the important role OTs can play in the recovery of clients with mental health concerns. Special Issue: Effectiveness of Occupational Therapy Services in Mental Health Practice. Am J Occup Ther 2011;65(3):235-237. doi: 10.5014/ajot.2011.001339. The man in the linked Washington Post article struggled to meet his many needs with few independent living skills. I just read a Washington Post article titled “In transition to independent living, the ‘dignity of risk’ for the mentally ill,” which focused on the experiences of a man named Kelvin who has mental illness and cerebral palsy. He had just moved from an assisted living facility to a small apartment near Charlotte, NC, and he was working with a team of “clinicians and social workers” who were helping him organize his life and transition to living on his own. It was a lengthy article, but as soon as I began reading it I instantly felt as if there was a place for occupational therapy in this man’s life. After reading the article, I was both sad for the difficult situation in which Kelvin found himself after leaving the assisted living home and frustrated that the services he was receiving might not actually have been making it easier for him to accomplish his goals and live independently. As a future OT, I saw several areas in which an occupational therapist could intervene to improve the services Kelvin was receiving. In case you didn’t know, occupational therapists currently play an important role in helping people with mental health problems and psychiatric disabilities. They work in community-based, outpatient, inpatient, and other settings to help people living with mental health concerns learn how to best complete the activities they need and want to do. Although there are some occupational therapists helping some people with mental health issues, there is not nearly enough supply to meet the demand. In the past, OT has not really been recognized as a profession that is equipped to meet the needs of clients with mental health problems, but this could all change in the very near future! On November 12, 2014, there is going to be a listening session to Support Occupational Therapy’s Inclusion in New Community Mental Health Services. It is vital that as many occupational therapy students, practitioners, assistants and supporters as possible get involved and comment on the session in order to show their support and advocate for occupational therapy services that could be of great benefit to people who access mental health services in the United States. Part of being a successful therapist is being an advocate for the profession, and what better way to promote OT than participating in this crucial political event! In April, Congress passed the Protecting Access to Medicare Act (H.R. 4302), which established a “Demonstration Program to Improve Community Mental Health Services.” This demonstration program will expand access to quality mental and behavioral health services by establishing federally certified community behavioral health clinics (CBHCs). The demonstration will initially establish CBHCs in eight states through a competitive process, but could eventually CBHCs could be in all 50 states. This fall, the Department of Health and Human Services (HHS) and the Substance Abuse Mental Health Services Administration (SAMHSA) will be writing the rules that define what mental health services and supports will be provided by these federally supported CBHCs. SAMHSA will be holding a listening session to help them establish the criteria for staffing, services, payment and coordination of care at the CBHCs. For those not able to attend and comment in person, there is also the opportunity to provide comments in writing. Written comments will be considered just as important as verbal comments during the listening session. We have been told by SAMHSA that it is important to have a strong demonstration of support for the inclusion of occupational therapy through comments and at this listening session. The development of these criteria is a watershed moment for occupational therapy’s inclusion in quality, community-based mental health services. By September 1, 2015, criteria will be published for state certification of participating clinics and guidance issued for participating states’ establishment of a demonstration Prospective Payment System for services. SAMHSA has the overall lead for the program and is responsible for the establishment of the criteria for the behavioral health clinics. It is currently too late to register to attend or provide verbal commentary, but listeners and contributors will have until November 26 to submit written commentary, which will be considered just as important as the spoken comments listeners make. Unfortunately, I will be working for half of the day during the session, but I plan to wake up early and catch as much of it as I can before I have to leave! At this point in history, occupational therapy has a chance to be included in landmark federal legislation that will have a great impact on American people living with mental health problems. It is absolutely crucial that we make our voices heard and take the time to support AOTA and the future of the profession in this endeavor, and I want to be sure I do my part! AOTA has links to several resources that will prepare you to leave a well-written, OT-endorsing comment that will be reviewed by the SAMHSA team. Although the main (and most important) comment-writing document is for “members only,” there are still other helpful links here. If you are an AOTA member, you can login and view their page of comment-writing tips here: http://www.aota.org/advocacy-policy/congressional-affairs/legislative-issues-update/2014/guidance-samhsa-comments.aspx. In case you are not an AOTA member, I have included several of their most relevant and important points here to help you write commentary for the SAMHSA session. All information below is from the AOTA. SAMHSA has provided “guiding questions” in a worksheet format to help structure your comments. Consider using the SAMHSA-provided worksheet, or write a letter using the worksheet as your guide. Consider submitting comments on behalf of a larger group of occupational therapy practitioners. One letter could be sent from a facility, state association, or simply have a list of signatures from interested practitioners. The comments will count as if submitted by each individual, and this will make less work for SAMHSA. If submitting on behalf of a facility or association, be sure to mention how many practitioners or clients it represents. Get signatures from non-occupational therapy practitioners if relevant and possible. Comment on as many of the guiding questions that you think are relevant, or on those of which you have expertise. Instead of synthesizing your overall thoughts, comment on each question individually, even if this means repeating something you have already written. Comments will be collated separately for each section. If you do write a comment, according to AOTA the most important thing to include is the following: Skilled occupational therapy should be a service available to clients on-site in CBHCs and occupational therapy practitioners (with their unique skill set that you will describe in your letter) should be a part of the staffing requirements. Each submission must include the Agency name (SAMHSA) and the docket number (2014-25822) for this notice. Comments are due by 5 PM Eastern Time on Wednesday, November 26, 2014. Hand Delivery or Courier: 1 Choke Cherry Road, Rockville, MD 20857, Room 6-1019 between 9 a.m. and 5 p.m., ET, Monday through Friday, except federal holidays. Please help make a positive difference in the future of Americans living with mental health concerns and write a comment for SAMHSA by November 26! And please comment and let me know if you do!